If we were having coffee, I’d tell you I’ve been in London for a few days, with my teenage children (hardly children any more but that’s for another post) seeing family (lots of family) and two very good, longtime friends. I’d tell you the weather was warm, sunny even, actually hot, and I wore dresses and sandals every day, and walked all over the place, rather than catching a bus or the tube, which apart from anything else made me realise how sedentary I’ve become in recent years. I love how vast London is, too, how you can walk for hours, across bridges, along the river, through parks, thorough market places, in and out of shopping centres, around cafe tables, alongside office buildings, in and out of restaurants and galleries and museums, and still have miles and miles of pavement before you. I like this portrait of William Shakespeare I saw on my (walking) travels. 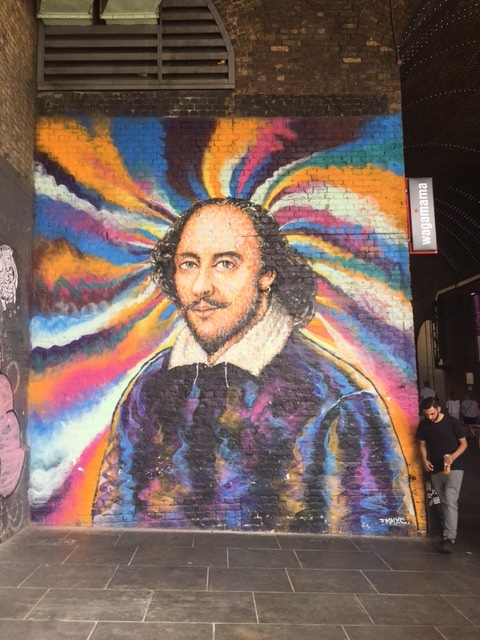 It’s been spray-painted onto a wall near Borough Market and near The Globe Theatre on the Southbank. The artist is James Cochran (or Jimmy C as he signs himself – you might be able to see his signature if you zoom in to the image). So if we were having coffee, I’d tell you how much I enjoyed walking everywhere, enjoyed the feeling in my bones and muscles at the end of the day, the feeling of my joints and limbs fully limbered up, used, stretched. I have great sandals (they’re Birkenstocks, bought last year, and I don’t think I’ll ever want to buy a different type of sandal again) and I’d like to buy some other types of shoes which support my feet well, so that I can walk in all weathers . I’d also tell you that I was away from my computer for many hours at a time, and out of the house, just outdoors, in the sun or the shade and that it felt liberating to be away from my desk and computer. I think I needed a break from routine, it’s done me good because it’s made me aware of my daily inactivity. I’ve put so much focus on writing, I’ve forgotten to listen to my body and its needs. 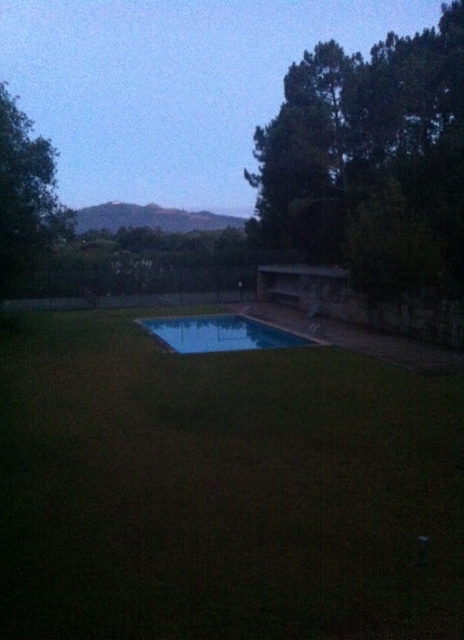 Going away has made me realise it would be a good idea to make some changes. If we were having coffee, I’d tell you I love London, I miss living close to London, I miss seeing my family and friends regularly, I miss the shows, courses, exhibitions, poetry readings, one-off events, concerts, job opportunities, cultural activities on offer, every day. And I’d tell you I can’t afford London, can’t afford to buy a house there, can’t afford to take part in everything I’d like to take part in, can’t afford to finance my kids there. I’d tell you I love visiting London and I’d tell you, actually, I like the anonymity of the small Wiltshire town I live in. I like its scruffiness, its slight but noticeable air of outdatedness. I like being able to opt out, drop out, to not compete, to not keep up. I’d tell you I don’t want for anything here, that you can get most things you want here. That I can get the things I want here. I’d tell you it’s actually rather nice and that London is only a few hours away on the train, if you need it. And, you know, the internet. We might talk about holidays, of course, it’s a talking point, it’s a safe topic, it’s something to talk about when awkward silences become too oppressive. I’d say, no, not this year. Nothing planned, nothing to book, nothing to cancel, arrange, lock up, wash, iron and pack. Nothing special to buy or order or calculate. Nothing to check or investigate or research or decide about. Because, teenagers, other plans, different social lives, exam results, college and uni offers, dates to be home, complicated calendars. I’d enjoy listening to you talking about your holiday plans. Pictures would pop into my head as you spoke. I’d tell you that I’m thinking of making changes to my life, that I’m in a different phase, that my teenagers are no longer children at all. I’d tell you that nothing is definite, that everything is up in the air, that I’m considering different ideas, and waiting to hear about stuff (funding, competitions, submissions, ideas, proposals), and thinking and still writing, still reading. If we met for coffee, we might stay talking long enough to order dinner, and wine, and more wine. Something light and delicious and drinkable. But I’d leave in time for The Handmaid’s Tale. I’d say isn’t it brilliant? I’m reading it again. You haven’t read it? You haven’t seen the series? You must! I’d lend you my copy. I’d say it was Diana who gave me the idea for a #weekendcoffeeshare. You don’t know Diana? I’d show you her website. Oh dear 😦 Not sure what’s going on there but post your own coffee post anyway. This is lovely! Will pop over to Diana’s site in a minute but yes to walking around London. I found myself with an impromptu day with the children a few years ago and we just went to Trafalgar Square and walked around St James and back up via Westminster. I was carrying a toddler then so not a huge distance but the sensation of walking and exploring was wonderful. Thanks for the Birkenstock tip too, have always wondered if they’re as good as they look! 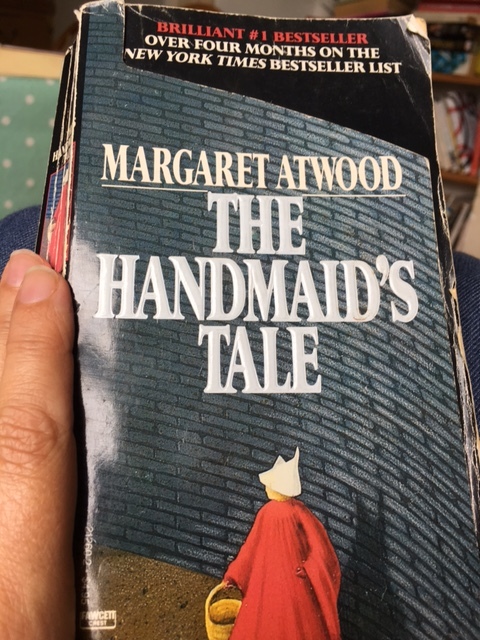 Yes also to The Handmaid’s Tale – I’ve also been watching and re-reading. There will be a 2nd season that veers more from the book, apparently – looking forward (anticipation and trepidation) to seeing where they take it.